When I started using essential oils last year to support my health naturally, I had no idea how many ways they could be used in my life. They are safe, natural, and effective for almost everything you can think of. I started by using them to support my sleep and energy, but I soon learned how they work with my body to support all areas of my health. If you’re just learning about essential oils, you might wonder what they are and why you should consider them for your overall health. In short, oils are volatile aromatic compounds that are found in the seeds, bark, stems, roots, flowers, and other parts of plants. They are extracted from the plant and distilled into what we know as an essential oil – more 50-70x more powerful than the plants & herbs themselves! They are a safe, natural, and effective alternative to supporting your health. In fact, they are a key tool that I use personally, with my family, and with my coaching clients. Those Sticky Stickers: You know those stubborn, sticky labels that come on your picture frames, jars, or whatever you just purchased? You try to scratch it off, but there’s still that awful residue left behind. Add 1-2 drops of lemon to the residue and let it sit for a few minutes — then it will just wipe off! Natural Degreaser? : You just fixed your bike & your hands are black and greasy. Soap alone isn’t taking off the grease, but lemon oil mixed with your soap will! Refresh your toothbrush: if your toothbrush seems a bit tired, add a drop of lemon and peppermint oils to chase away that run-down feeling. Stop Cutting Board Bacteria: cutting boards can harbor bacteria in your kitchen, but if you clean it with chemicals that can transfer to your food! Lemon oil is a great option and you’ll love the taste. Spot-Free Dishes: add a few drops of lemon oil to your dishwasher soap container with each load. Your dishes will come out looking like new + spot-free! Energy Boost: for a quick, refreshing energy boost, combine a couple drops each of lemon essential oil and peppermint essential oil in a glass of water and drink up. Add a lemony taste to your bottled water! I start each day with a glass of water with this combination. Preserve What You’ve Got: use lemon oil in a spray to keep your cut fruit fresh or avocados until serving. De-scratch Your Scratchy Throat: adding a couple drops of lemon essential oil to warm water + honey or maple syrup can change that yucky irritated throat feeling, slow a nasty cough, and douse high temperatures. Nice Mood … No Really: chase away the moody blues (not the band), with a bit of blah-reducing lemon oil. 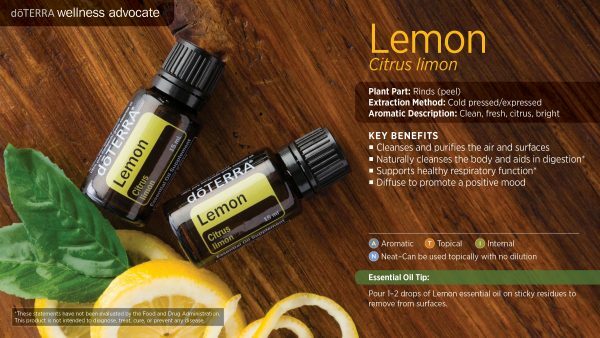 Whether you choose to diffuse it or apply topically, it’s hard to not improve your outlook with lemon oil around! A Brighter Complexion: lemon oil can help remove dead skin cells and exfoliate. For a homemade exfoliant, add 4-5 drops to a small amount of oatmeal and water for a homemade scrub. Feels great! 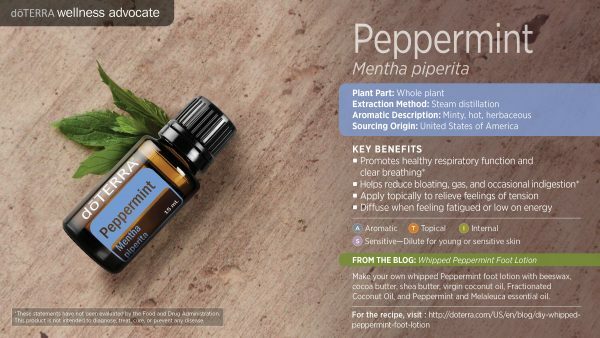 Calm Stomach Upset: just one drop of peppermint oil rubbed on the stomach or taken internally can calm indigestion, an upset stomach or other internal digestive commotion. A must-have when traveling! Feel Full, Faster: satiety… it’s about feeling full, and not overeating. The aroma of peppermint oil has the ability to make you feel full, faster…especially if you breathe it in during a meal! Chase Away Tension Headaches: got a mind numbing headache? A few drops of peppermint dabbed on your temples, neck and sinuses can quickly spring into action and chase that headache away! Perk Up Your Tea: just one drop of peppermint oil can add life to any herbal tea (without having to add lots of sugar) while also aiding in normal digestion or to relieve heartburn. A “Should I Work Out Today?” Antidote: you ask yourself this question. It’s OK. Using peppermint oil prior to exercise immediately awakens your senses and gets you in your right mind so you can crank. Unforgettable Beverages: peppermint water on ice, peppermint mocha, peppermint tea, peppermint hot chocolate, that’s right … it’s all delish. I love drop in my morning coffee! An Itch Fix: if you have the after effects of a sunburn where skin is a little warm and itchy, apply a drop of peppermint oil (mixed with lavender) to cool, soothe and stop itching. Movement relief: if you’ve got that “my gosh, I can’t believe I just went on a spinning ride” feeling, 4-5 drops of peppermint rubbed on the stomach can calm stomach muscles and help dispel discomfort. Take the Bite Out of It: insects, creepies and crawlies are not too fond of the smell of lavender. In fact, they hate it. If you forget to go the prevention route, lavender soothes bites, itching and inflammation. Mind Racing or Kids Wide Awake? : lavender drops on pillows work like magic. It helps ease your mind, calm down, and lull you (and them) into a restful sleep. Pet Smells No More: add a shake or two of your baking soda and lavender mixture to carpets and vacuum up! If you have pets, (especially the un-potty trained variety), fight back with lavender! Bake Like the Best: lavender is a nice addition to lavender blueberry banana bread, lemon lavender cookies, baked salmon, lavender sugar cookies, lavender muffins, lavender cakes, oh yeah! A Dry Climate Answer: if you suffer from dry, itchy skin, and don’t want to mess around with chemical smelling lotions, add lavender to fractionated coconut oil and comfort will be yours! BONUS!! Fortify Your First Aid Kit: there are many dōTERRA products that would be awesome additions to your First-Aid kit, but if you could only pick one, Lavender should be it. Why? Basic First-Aid kits are often geared toward minor skin irritation, scrapes, rashes, and so forth. Lavender is great for all those, not to mention its calming properties! That’s a lot of different ways to use just three oils – but it’s not even half of the uses I’ve pulled together. 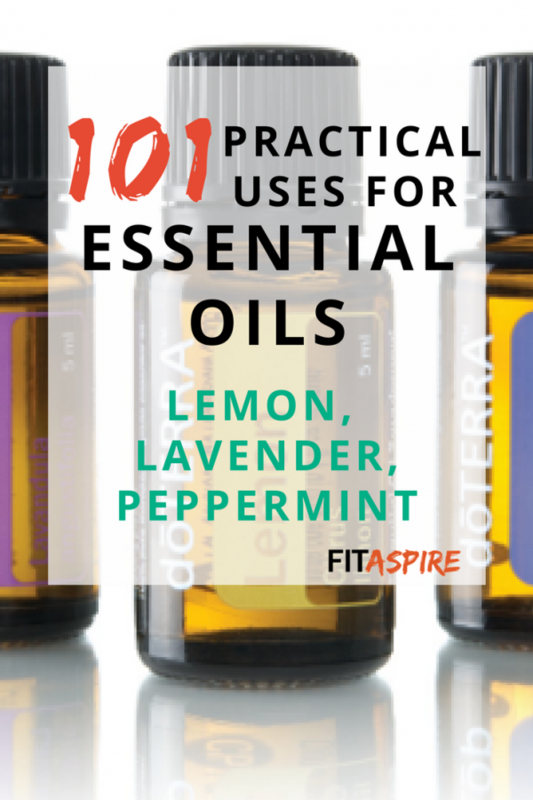 You can download the full guide with 101 uses of lemon, peppermint, and lavender by clicking the link below. What is the most interesting, or most surprising, use of these oils to you?